or 14-0 Express on Hudson between Indianola and Summit. Colombia represents! El Manantial Latino is our second truck with food (and owners) from that part of the world in as many days, and we’ve found that they make a compelling case for occasionally straying from the city’s many mobile Mexican offerings. Upon ordering, we were heartened to see the cook hand-forming our empanadas from scratch. ‘Fresh’ is the word here, and we were told that they hoped to reflect that attribute in their name (Manantial means ‘waterfall’). 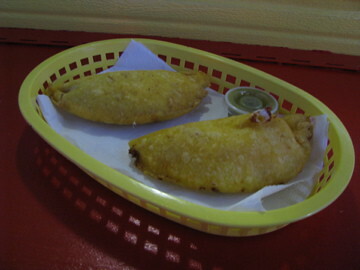 The empanadas were crispy and, for having just emerged from the fryer, remarkably light and not too oily. We tried the beef and cheese options, and while both fillings were pleasing enough, neither had quite the satisfying complexity of flavors found in the empanadas from 8th Taste. Perhaps the taste bud abuse I endured from the screaming hot green sauce that Manantial’s empanadas are served with contributed to that impression? Go ahead, call me a wimp, I can take it. The arepas (above), also formed and cooked as we watched, were even more popular – I suspect that’s at least partly because they hit TTC’s collective soft spot for carmelized cheese. Served with an especially appealing style of chorizo slices, our order disappeared quickly. Satisfying though the above were, we can’t help but feel as though we missed out – El Manantial offers a wide range of rotating special items that, if we understood correctly, are only served on Saturday and Sunday. Luckily, they send out email updates to provide customers with the latest info. Personally, I’m keeping an eye out for the next appearance of their Colombian tamales. elmanantiallatino (at) hotmail (dot) com. They also have a facebook page. A parting thought – one of the true pleasures of taco truckin’ is the opportunity to, unlike in most restaurants, routinely interact with the people who own the establishment and prepare your food. Occasionally the language barrier may pose some difficulties to the spanish deficient, but respect for the customers and pride in the food are easily communicated even without words. At St. Stephen the Martyr parish on the West Side, we have a large Latino community. This Sunday, starting at 1 pm, (after the noon Mass in Spanish) we are having a garage sale/carwash/TACO SALE! fundraiser. The proceeds from the fundraiser are going to the Bring The Sisters to Columbus fund; our parish, in conjunction with the Diocese of Columbus are bringing some missionary sisters from Mexico to aid in the Latino ministry throughout the Columbus area. So, if you want homemade, authentic tacos (and other food) and would like to contribute to a worthy cause, show up and buy some tacos! St. Stephen the Martyr Church, 4131 Clime Road; parish phone 614-272-5206. See the website link for the event flyer! This likely has nothing to do with the church event above, so please go and enjoy. But dissappointingly, this particular truck needs a lesson in basic food safety. It was at the July 3 celebration in the Arena district. One of the food preparers was scooping raw chicken with her gloved hand, then going straight to loading tacos & handling cooked food. This is the most basic rule there is (besides, you don’t poo where you eat). I’m the last one to walk away from food served from a vehicle, but I walked away. If someone here knows these folks, they should have a talk with them and try to get them to understand. I went to that Red, White and Boom! celebration with my friends too and guess what? I came near to this trailer and it was the BEST Latino food I’ve ever tasted. A couple days ago I’ve talked to the folks because I work for the government and they have already taken a food safety class. If they hadnt taken it, trust me the City of Columbus would have never let them open up this business.They even have an inspector that comes to them without notice, and they always pass the food safety. I stayed for 30 minutes observing while she was preparing food for her other clients and it was all clean. In addition, the food was cooked throughly and the cook was also wearing gloves. I strongly recommend you to go to El Manantial Latino Restaurant, because it is the BEST LATINO FOOD YOU”LL EAT!!!! Last time that I went I ordered 2 arepas (corncake) with cheese and 1 burrito, and they were delicious!! This trailer is so unique because they cook both Colombian and Mexican food. My buddy & I stopped by after a Clippers game today. This is only the 2nd taco truck either of us had been to & we were happy with most of the offerings. The pastor tacos were good (better than the steak), the empanadas were very good as were the plantain fritters with beef. It was kind of awkward parking since it was a pretty busy gas station, but the staff was very pleasant and helpful. One thing of note is that since the photos above, they have added a VERY NICE, color photo menu with both Spanish & English that takes up about 1/2 of the cart’s front. Very helpful! Empanadas were the tastiest part of my order. I will defintely go back just for these! The al pastor tacos were better than the steak tacos, but not as good as the al pastor from Los Guachos. I was not impressed with the cheese arepas. Perhaps arepas with beef would be better? The menu with pictures was helpful and the staff was more than willing to assist with any questions. Food was boxed up very well for take out food. Don’t be silly, arepas are only for cheese. Should you want meat then order enpanadas. Don’t change the traditional items to enclude things you wish they had. I don’t know what El Manantial offers for arepa fillings but I’ve had all sorts. Beef, ham, pork, tuna, beans and yes cheese are all delicious arepa fillings. Arepas are certainly not for cheese only. 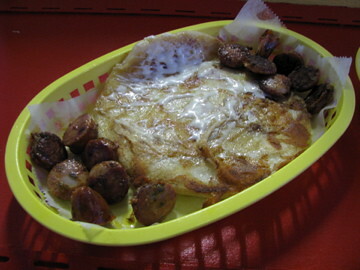 I agree w/ Bill…arepas (at least in C-Bus) have all sorts of fillings/topping options. You were right about the empanadas! They were soooooo delicious! delicioso! (as Dora’s backbag would say). The burritos were also excellent, their burritos are different from Chipotle but quite mouth-watering! Yes, definetly the arepas with beef are better than the one with cheese only. By the way, I heard that they were going to the Festival Latino (Latin Festival) in downtown Columbus, which is great! Festival Latino is going to take place on August 15 and 16. El Manantial Latino Restaurant has moved to High St. with Lane Ave. in the Shell gas station. So glad to see these guys are now close by at Lane and High. The Colombian tamale is delicious, as are the tostones, which they also make fresh to order.. FYI, the lady said that they would be open every day except Tuesday, and would feature a lunch special every day. My husband and I stopped by yesterday for lunch. Everything was delicious and the Columbian offerings were a nice change to the standard Mexican. The arepa w/ cheese was delicious and I also got a side of plantains with cheese- also delicious! My husband got the lunch special- seasoned beef and boiled potatoes, rice and salad- very filling and a great price. We will definitely be going back, the entire menu looked good! The woman working was very friendly and nice as well. It’s exciting to have a taco truck in the campus area, so I hope they stick around for a while! This truck is no longer in the Shell station parking lot, fyi. Not sure where it is now. That’s a surprise – we saw it just the other day. Do you know how long it’s been absent from that location? Just noticed maybe 3 days ago, or so. El Manantial Latino Truck is closing for February because of the cold. It’s coming back and opening in March in the same location (Shell Gas Station). Great news – thanks for letting us know. We look forward to seeing you again in the warmer weather. i went there today, no taco truck in the shell lot. Let us know if it continues to be absent. It’s not unusual for a truck to move out for a day or two (and is even sometimes required by zoning). she was there today, open for business.. Went here for dinner on Monday. The arepa was great! I was finally able to try El Manantial last Friday! 9/17/10… It was absolutely wonderful! I had empanadas and tacos. Had the steak tacos, they were excellent. Empanadas and Colombian arepas are the best! Does anyone know if El Manantial is still in business??? They were gone last night. Not sure why/what happened. From what I understand, Shell is in the process of re-sealing their asphalt and thus needed El Manatial to move for the week. They should be back soon. Tried to go for lunch today and they were not there. When I called they said they would be back on Thursday. They were back when I went past earlier today. Yes, El Manantial Latino is back. A new Menu with a new variety of foods is on its way. I will keep you updated once it’s up. Stopped by the Shell station on 08/11 anticipating another great lunch from El Manantial and was bummed to find out that they were not there. Anyone know if and when they’re coming back? El Manantial was supposed to return to 14-0 in a couple weeks with a new truck. Nothing so far. Help! There is a Manatial-colored food truck (still closed, no signage or anything) parked at 14-0. Hoping this will be Manatial and open up soon! Thanks It sure looks like it. The truck at 14-0 still isn’t open. I asked the manager at the store if he knew what was up and he told me the owner of the truck told him he’s having trouble “with the gas.” Since he’s paying weekly rent to park there it looks like he plans to open whenever…. The truck at 14-0 was not open when I went past, however it did have El Manatial signage up. Steps in the right direction! This truck is now open for business. Truck hasn’t been on Lane Avenue for a long time now, it’s on Hudson. Please update the map. Thanks! Will do – we are in the process of updating that post. For the rest of you – the Hudson St. Address at 14 – 0 is correct. Truck hasn’t been on Lane Avenue for a long time now. Please update the map, it’s at the Hudson location. Thanks. Seriously, the arepa con carne at this place is stupid good. Franci is the name of the lady who owns it; she tells me that she now has another truck, she’s just looking for a place to put it. She says it’ll feature a lot of the same food with a couple new additions; here’s hoping she finds a spot on the east side!